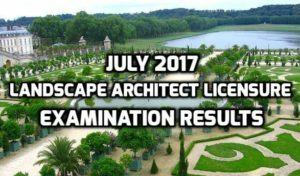 The Professional Regulation Commission (PRC) already revealed the list of successful passers for the July 2017 Landscape Architect licensure examination after 2-working days of the final board exam last July 11-12. According to the commission, 71 applicants took the examination and 37 of them passed the board. The PRC Board of Landscape Architecture administered the board examination and Chairman Paulo G. Alcazaren headed the exam along with board member Cecilia H. Tence. The designated test center of the PRC is in Manila.